Trainer red will switch with the next pokemon that's in the next stage. Charzard,Ivyasaur,and Squirtle will attack with 40% each.witch is 120 damage to the opponent.This attack will not work if all three pokemon in the battle. 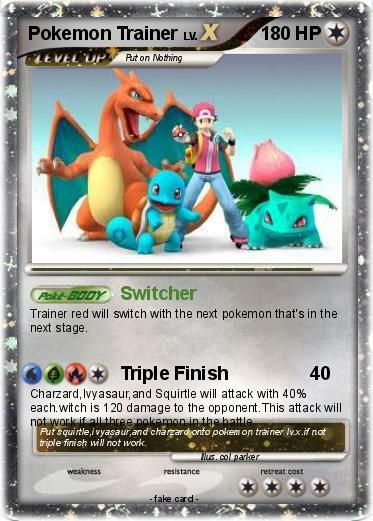 Comments : Put squirtle,ivyasaur,and charzard onto pokemon trainer lv.x.if not triple finish will not work.